The Harris’s hawk swoops directly over my daughters, its powerful wings audible in flight. I duck, but my children barely flinch, so riveted are they by the raptor’s low flight path as it glides to perch on a snag a dozen feet away. 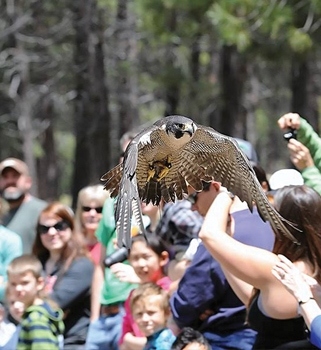 We are at Raptors of the Desert Sky, a live action show at the High Desert Museum featuring birds of prey. In succession, a barn owl, a vulture and two Harris’s hawks were brought out by staff and released to fly free in the high desert sky over our heads. The size, strength and skill of a bird of prey becomes very real when you get a chance to see it up close. These are some powerful — and incredibly graceful — birds. 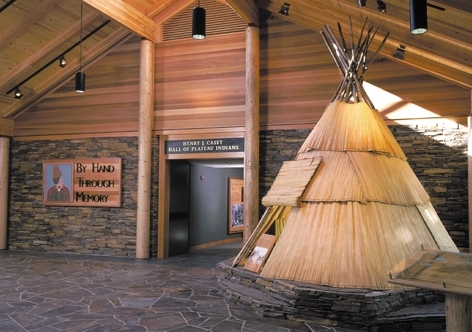 The museum interprets the cultural and natural history of the high desert in exhibits, living history and a live-animal collection. We visited the burrowing owls, a bobcat, a rattlesnake and Tank the tortoise. Then we took a walk through high-desert history in the Spirit of the West exhibit — complete with an encounter with a woman in calico dress and sunbonnet sitting wearily by her prairie schooner on the Oregon Trail — before venturing outdoors to catch the raptor show. 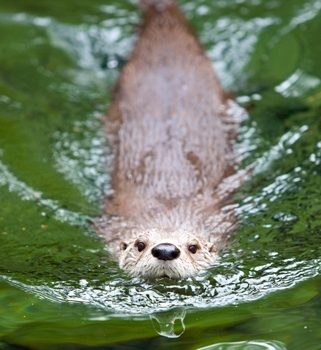 High Desert Museum exhibit and raptor images provided by the High Desert Museum; otter by Tyler Roemer. After our awesome bird-of-prey encounter, we get back on the road, as our agenda for the day is substantial. Sometimes it’s easy to forget that the natural beauty around us in Central Oregon is entirely volcanic in origin. 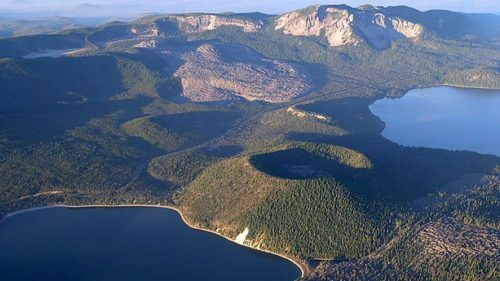 Newberry National Volcanic Monument is a protected 50,000 acres of volcanic landscape, featuring caldera lakes, lava flows, lava tubes, obsidian fields and cinder cones — including Lava Butte, just a few miles south of the High Desert Museum. In 2015 the monument celebrated 100 years. Visitors can drive to the top to take in incredible views of the Cascade Range, lava flows and many more cinder cones. Lava Lands Visitor Center is adjacent and gives some insight into all that we see. The Cascades were created by balloons of magma springing up from the collision of the North American and Juan de Fuca plates. 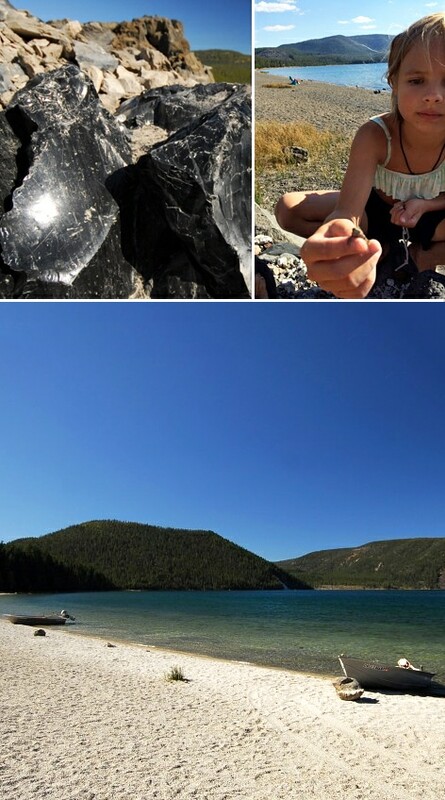 Newberry was created by many volcanic eruptions beginning 80,000 years ago and continuing up to a mere 2,000 years ago. The volcano has been dormant since, but in its collapsed caldera, at the rim of one of two lakes, is evidence of enduring volcanic activity by way of an undeveloped hot springs. 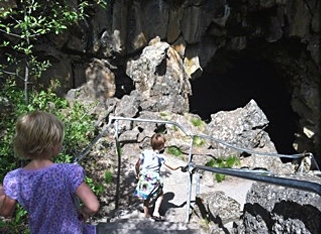 From the Visitor Center, we journey to Lava River Cave, Oregon’s longest continuous lava tube. Lava tube caves are formed when a river of lava eventually forms a crust over the top, enclosing a tube from which the lava drains out, leaving behind a tube, or cave. Visitors can venture more than 5,000 feet into this cave’s interior, but on this hot sunny day, we choose to simply peer into the cave entrance. Stalactites and stalagmites appear in the shadows, and we feel a blast of cool air (the cave interior holds steady at 42 degrees year-round) before we move on to Lava Cast Forest. Here, lava flows surrounded living trees, incinerating them but not before hardening around the tree trunk, leaving a cast of the tree behind. “Mom, they are tree ghosts,” says my daughter Libby, age 9, as she pokes her head into a perfectly cylindrical hole in the ground. Now it’s time to make the climb up into Newberry Volcano. The drive east from Highway 97 rises steadily, and when we emerge from the car at the Big Obsidian Flow trailhead, the air temperature is 10 degrees cooler than it was at Lava Lands. The caldera basin is above 6,000 feet; Paulina Peak, Newberry’s high point, is nearly 8,000 feet. The Newberry Obsidian Flow is a completely surreal and utterly volcanic landscape with a trail running through it. Chunky black glass rock (aka obsidian) is everywhere in this lava flow, the youngest in Oregon. The girls pick their way competently around jagged, glistening rock, begging to take some home. But since this is a national monument and no collecting is allowed, I hand over my iPhone so they can snap endless photos. From the top of the 1-mile-loop trail are views of Paulina Lake and the Cascades in the distance. The air is cool and crisp, and a single, very persistent pine tree grows from the top of the lava flow. After our hike, we travel the shores of the two lakes — Paulina and East — passing several campgrounds on the way. I know that the aforementioned hot springs is on East Lake, about a mile-and-a-half walk from East Lake Campground, but our day is getting away from us, so we save that adventure for another time. Both Paulina and East lakes are famous for fishing, and boats galore churn their waters in search of trout. Fly-fishing is popular here as well, and the birds also know what they are doing — Libby points out two osprey working the lake in search of dinner. East Lake is large, rocky and little treed; at this elevation and in a volcanic caldera, the landscape is much more stark and exposed than at other Central Oregon lakes. We set up our beach chairs, towels and a few snacks on the rocky-sand east shore of East Lake, peel down to our swimsuits and leap into the lake. Why not? It’s nearing 5 p.m., but the air is still warm and the water refreshing. 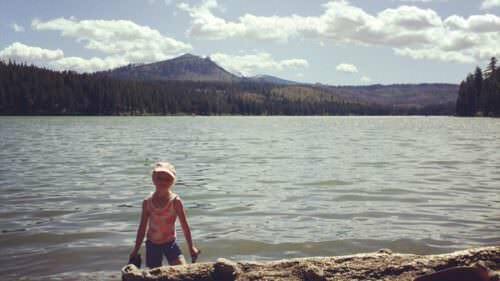 As our skin cools fast in the high-desert air, we explore the lake from the nearby dock. Maris uses her newly refreshed geology skills to conduct a little experiment. What will float? The grey pumice stones she collected on the beach, yes; the red cinder, no. 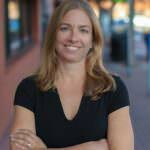 Meanwhile, Libby calls to us — she has discovered a passel of frogs in a rocky embankment. They are dime size and perfectly camouflaged to the stones. I am always amazed at what children spot in the vastness of nature. Soon she has collected a dozen, sharing them with a few other kids who have gathered around. The wind has picked up and our stomachs are grumbling, so we venture to Paulina Lake Lodge to locate provisions. This retreat attracts families year-round (in the winter, access is by ski or snowmobile only). 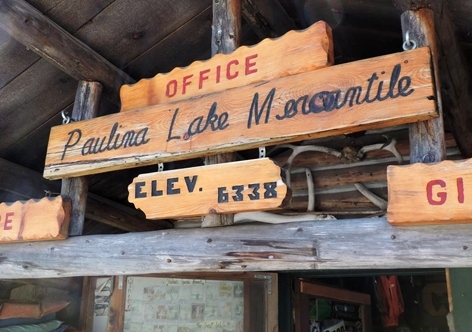 More wooded and grassy than East Lake, Paulina is another great fishing lake that offers a handful of rustic cabins, a small store and a modest restaurant. Tonight is taco night; a buffet is lined with Mexican delights, and folks gather at communal tables. We nosh on tasty tacos as the sun sets, lighting up the lake with a fiery glow. After dinner my girls explore the dock as I snap a few shots, and I’m reminded why photographers call this time of day “magic hour.” The lake is bluer and the sky pinker than at any other time of day. But daylight is waning fast, so we descend from the volcano to the high-desert floor and head for home, content at a fantastic day spent learning and playing in the volcanic landscape of the high desert. 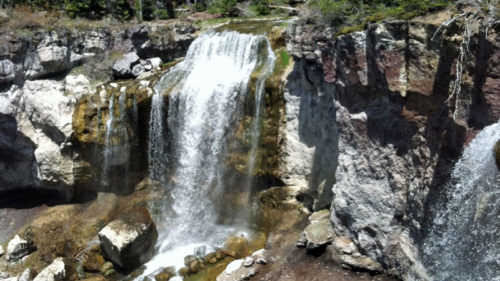 What are the must-do trails south of Bend?